Excess moisture doesn’t just evaporate; it takes your design with it. You can preserve your design and the concrete with proper moisture testing before stains and sealers are applied. Beauty and strength converge in decorative concrete. Like a good acid stain, they fuse together to create a durable, pleasing floor that literally becomes the foundation of its space and atmosphere. Achieving the desired result requires that you consider a number of variables for the specific stain and sealer combination you select. One of the most important variables that need your attention is the moisture content in the concrete at the time the stain and sealer are applied. 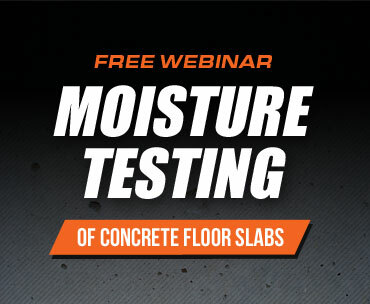 Moisture in concrete can come from two main sources. The first is the volume of water used to mix the cement into concrete. Second, external sources of water may be an issue, such as water that can migrate from the ground to the concrete slab in the absence of a vapor retarder. Both evaporating water and pooled water can interfere with a stain or sealer. Efflorescence – As the concrete dries and its moisture rises upwards through the slab, it brings salts within the concrete to the surface as well. When too much moisture is moving through the concrete, it leaves a salt residue called “efflorescence”. As lovely as the word sounds, efflorescence is rather unsightly. Depending on whether or not the floor has been finished yet, efflorescence manifests in different ways. It can leave a white powdery substance on the concrete’s surface after staining but before sealing. If the efflorescence gets trapped underneath a sealer and/or certain stains, it will look like a white “blush” has been spread on the concrete. 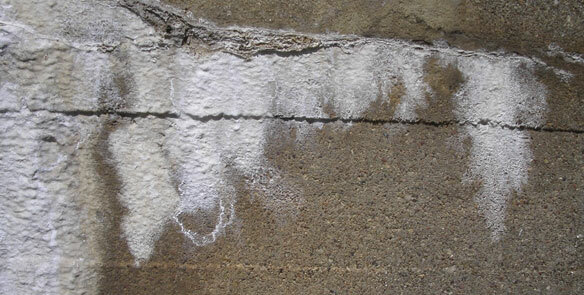 Efflorescence can cause other stain or sealer failures, which are noted below. Reactive and non-reactive stains color the concrete in different ways, leading to different indications of moisture damage. In the case of reactive stains, the problems generally have to do with color variations. Undesirable color changes – The acid in reactive stains contains metallic salts that instigate a chemical reaction when they mix with the free lime in the concrete. This reaction provides the stain color, but when excess moisture exists, the salts or acids in some blue and green stains can turn brown or black. The exact cause isn’t clear, but the most popular explanations attribute the undesired color change either to oxidation or a fungus, both of which can happen with excess moisture. Lighter or uneven coloring – Efflorescing salts in the presence of excess moisture will retard stain penetration, which interferes with the chemical process of the acid stain coloring the concrete. Use of non-reactive stains in the presence of excess moisture gives rise to a different set of issues. Since a non-reactive stain colors the concrete by filling the concrete’s pores or by creating a film that sits on the concrete’s surface, typical moisture-related problems include flaking, peeling, bubbling, blistering and dark spots. Excess moisture can create several different problems when it comes to using sealers. The first one described here occurs when using a water-based sealer. The rest may occur when solvent-based sealers are applied in the presence of excess moisture. Powdery or white substance – The sealing agent evaporates faster than the water when there’s too much humidity, so they never bond together, leaving this substance behind. Greyish or cloudy spots – Moisture can lift the sealer from the concrete, which causes light to diffuse underneath the sealer (also called “sealer diffusion”), resulting in the appearance of discoloration. Color whitens or “blushes” – Too much moisture on surface prevented the sealer from bonding, so it floats on the water instead. Cracking, chipping, peeling, or flaking – This is another consequence of by moisture that can’t escape. Frothy foam – The resin in a two-part solvent sealer bubbles when mixed with too much water, leaving a foamy substance. As the concrete dries, moisture evaporates. Since a vapor retarder is typically placed underneath interior concrete slab installations, all of the moisture must evaporate by traveling upwards through the slab. Furthermore, if the relative humidity (RH) in the concrete and the air around it are different, the concrete will either give off or absorb moisture. The volume of water to be evaporated and the rate at which it evaporates both impact when the concrete is ready to take a stain or sealer. The many moisture-related problems described above can be avoided if the stain and sealer are applied when the moisture content within the concrete slab reaches an acceptable range – one that takes into account the specific moisture tolerance for the planned finishes. By waiting until the concrete has dried sufficiently, you won’t be trapping excess moisture when applying the stain and sealer. Conducting a moisture test beforehand is the only way to determine if the concrete is ready to be finished. One commonly-used moisture test in the United States is the calcium chloride test. This test relies on an element (a salt compound) placed on the concrete’s surface to gauge whether excess moisture remains. The problem with this test is that it only measures moisture at the surface. 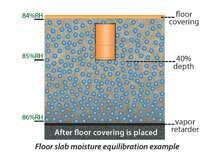 Because a moisture gradient (drier at the top, wetter at the bottom) exists within the concrete slab as it dries, the calcium chloride test does not provide an accurate representation of the true moisture condition deeper within the slab, nor does this test indicate the moisture that will later be seen at the surface as the slab moves toward a moisture equilibrium. A far better test for evaluating the true moisture condition of the concrete is in situ RH testing. This test has been used for some time in Europe and is now becoming the standard in the United States due to the scientific evidence supporting its accuracy. When RH probes are placed at 40 percent depth within the slab (the correct depth for placement when the slab is drying from the top only), it has been demonstrated that the test results provide an accurate representation of the RH in the slab after it is sealed. If the RH is too high for the finish’s tolerance, the finish may not live up to the expected visual and/or performance expectations. While it is critical to choose the right test – in situ RH – for getting an accurate measure of the moisture level of a concrete slab, it is equally critical to know the RH readings that will be considered acceptable for applying a finish for your specific project. The results of the RH moisture test must be evaluated against the moisture tolerance specified by the manufacturer for that exact stain or sealer. Pay particular attention to how permeable or “breathable” the finish is. Epoxies are the least permeable, which means moisture trying to escape the slab is unable to do so, and if those moisture (RH%) levels are in excess manufacturer’s recommendations, these will be the most likely to cause damage. The manufacturers of the stain and sealer being used in your project have their recommendations, which must be considered. However, certain other factors, which may be unique to your project, should also be taken into account. Waiting to apply the stain and sealer until the concrete is ready takes planning and patience. However, the little bit of extra effort is more than worth it. You will avoid significant problems and achieve the result you seek: a high-quality decorative concrete that offers exceptional longevity and beauty. I think my concrete guy applied the sealer before the concrete was dry enough. It looked fina at first, but now several days later there is a white film under the sealer. Is there a way to fix this? This was supposed to be my finished floor in my new house, but now I don’t know what to do. Thanks for any info you can provide. Jack. Unfortunately, the description you provided could be multiple things. We could be talking efflorescence, which is the salts migrating up through the concrete. This could potentially be under the “sealer” or on top of it. The salts are always available in the concrete, but usually high levels of moisture can act as the vehicle, transporting them to the surface. There could also be an issue with the “sealer” itself. Remedies for either could be different. As I will always recommend, go back to the tradesperson who did the work and see if you can come up with an appropriate remedy. Excess moisture doesn’t just evaporate; it takes your design with it. You can preserve your design and the concrete with proper moisture testing before stains and sealers are applied. Beauty and strength converge in decorative concrete. Like a good acid stain, they fuse together to create a durable, pleasing floor that literally becomes the foundation of its space and atmosphere. If a stain is already flaking/chipping as a result of a high RH in the slab prior to sealing would the introduction of water to the surface exacerbate the problem? For example if a large amount of water from a failed plumbing supply line pooled on the floor could that water migrate into the slab and then result in the stain chipping? Thank you in advance for your response. Thanks for the question. It’s a possibility. The flaking could make the surface of the concrete more permeable, allowing additional moisture into the concrete. The problem may also stay somewhat localized if the intact portion of the “system” has low permeability and doesn’t allow much of the moisture past the surface. What is the long term prognosis for a concrete floor which has multiple paler llemishes appearing below the sealer. The floor has been done now for nearly 12 months and getting worse. Is it a problem the tradesperson should be fixing or is it just bad luck. I am worried there will be total long term deterioration.. This is hard to diagnose via email. I would start by enlisting the tradesperson that did the work and get their professional opinion. I just moved into a brand new home with a water-based acrylic stain throughout the house. The stain is peeling/flaking up with the most minor of abrasions. For example, had to put the brand new fridge on the ground and roll it into the refrigerator cabinet..it dug through the finish and down to the bare concrete. Under our bed frame where the roller shifts around slightly, there are flakes coming up everywhere. What did the contractor do incorrectly? How can it be remedied? My brother In laws, hubby and myself decided to add outdoor tiles on top of an existing concrete patio slab. We are not professionals in anyway, but have helped to complete many other outside garden projects together like pergolas and such. My question is: after we put down the tiles, the rains came and we covered it with a tarp for several days — so not to get them wet as they were drying. That was over the 4th of July weekend. We have been getting rain almost every day/week as to date. When we waited the 10 days prior to lift off the cover tarp, we saw white residue and when we stepped on it, it oozed and bubbled in certain places. I know this is too much moisture underneath. Now what do we do? We can’t stain it yet, because everyday it’s raining again and now it’s uncovered as it just sits. I can even press down the grout with my finger between the connecting tiles–cause it’s soft. We tried to do this by ourselves to save on a professional coming in, and ironically it looks rather nice with its slate stone finish. But still, I believe even if the professionals did come, they and we still would have had the same problem because of this endless rain almost every day. The backyard patio is not a big area- just an average step-out length rectangular area, but what do we do now? Should we pull the whole thing up again and have someone else do it or what? This rain is not letting up on the weekends or some weekdays. My brother in laws went back to Ohio. We live in Tampa Florida by ourselves and me and hubby can’t do this project alone. Sorry for the problems. First, I am not sure what kind of setting material you used. If it is a Portland cement based mortar, I would think the 10 days of tarping should have been sufficient for the mortar to set up. It sounds as if the mortar may have been severely over watered at placement and/or the tarp did little to nothing keeping the rain out. I would think, depending on the severity of this issue, that the mortar will set, eventually, but with so much water, the bonding strength may be compromised. I would contact the manufacturer of the setting material and have a discussion with them prior to doing anything drastic. I hope this helps. I had a new patio poured and it did not look the best so the contractor put a resurfacer on it. It has been 3 days now and there are dark and light areas. Will it ever turn all white? Thanks for the question. It’s hard to say for sure, but as concrete cures and dries it will usually develop one, fairly consistent color. Our stamped concrete is four years old and the first coat of sealer that was applied at the time it was done was fine and looked great but after a couple of years it was looking dull. We decided to put another coat of sealer on it last summer, it looked great all summer but over the winter a good portion of it now has white areas either under or in-bedded in the sealer. How can we fix this? Can it be fixed without stripping it down to the concrete? Thanks for the comment. I would reach out to a local decorative concrete contractor to diagnose the problem in order to come up with a proper solution. You may need to, as you suggest, start from bare concrete in order to “fix” the problem and then apply a new topping/sealer, but there may be a better alternative that they can recommend. We had our slab poured in the summer of 2016 and the shop/apartment went up over the winter. This spring we laid laminate flooring directly on the slab. A few days later we noticed they were peeling up due to moisture. We had a very hot, dry summer but trenched all the way around the house to make sure that wasn’t the issue. Recently we had someone do a decorative stain and seal on the floor. About one month after it was down we noticed blistering on the floor. There has been no discoloration but the blistering encompasses most of the 1400 basement. We were told the vapor lock that was applied would eliminate any moisture from surfacing. Any idea if this is true or if we are looking at another moisture issue? Thanks for the question. Obviously, without being there, I can’t be sure, but it sounds like another moisture issue. Not all “vapor lock” type products work on unlimited moisture levels, so testing is necessary to apply the appropriate product. I am not sure if they tested or not, but this should be one of the first steps. I moved into a rental that has very dark stained concrete floors. Per the rental agreement we are only allowed to use Bona floor cleaner and water on the floors and they require the floors to be refinished every 6 months. I have complied with the maintenance of the floors and last finished the floors in August. I have been noticing rust colored spots ALL over the floors, and even under the rugs and behind the fridge where no finish was applied. It’s all over; the beautiful dark maple finish is now spotted everywhere. I’ve also notice blistering of the floors in certain areas and a milky color in some areas well. It seems to be getting worse and I’m not sure what to do. The house in about 3 years old, I’ve lived here for about 8 months and I believe they are going to try to charge me for the floors because I was told that they didn’t have this problem when they lived here and the previous tenant did not either. What can be causing this on the floors? Was it a problem when the cement was poured? Stained? Why is it just showing up now? I’ve asked them to ask their builder who informed them if the floors were maintained there should be no discoloration, but I’ve only used a neutral Bona cleaner and steam mop in between cleanings. Help. Thanks for the question. It’s hard to say exactly what the issue is here. It could be that there is no vapor retarder below the slab. With this, depending on the amount of moisture in the soil, the potential for “issues” on the surface may vary. This may be one reason for your “why now?” question. Another thing could be the refinish…was it done by the same people that have done it the last three years? Was the same product utilized? These are a couple of things that may potentially cause the issues you are describing. Good luck. I’m looking into finishing the concrete floor of a 1,200 sq ft 3 car garage/workshop. I’ve looked into epoxy and stain options and both paths appear to have limitations and degradation concerns around scenarios where you have excessive moisture issues. The structure is built on a hill/slope, at the end of a larger hill and the area has a high water table. Not sure there was an actual water vapor barrier under the slab either. Let’s just say long term, there is no real way to effectively mitigate the excessive moisture issues as a whole that would negatively impact concrete floor finishing applications. Are there any options that would work best considering this ongoing high moisture scenario? Thanks for the comment. I would look for a very breathable coating and/or look to just doing a polished natural application with a sealer. Either way, I would consult a coating/polishing professional in your area for guidance, whether an actual contractor who will be performing the work or a knowledgeable supply house that can offer advice. I hope this helps. Last November we finished building two new homes on the same lot. The bottom floor, for both, have finished concrete with radiant heating pipes thru it. We applied the finish decorative stain and sealer six months after pouring the original slab, so plenty of time to dry. (it was the summer in California) We used two different colors on each, one was antique gray and the other dark chocolate. Now, one year later, the house that had the dark chocolate starts to show problems with the finish. If you walk bare foot, you would get brown bottoms, in one place, under a area rug that had the rubber pad under the rug for movement, that rubber completely sticked to the floor and looked like its melting. In some area it’s even cheeping like paint. The house that had the antique gray applied has no issues at all. What do you think is the issue and how can we fix it? Thanks for the comment. There could be a number of issues. The rubber on the rug makes that area non-breathable and it could be causing more moisture and more salts to migrate from within the slab; raising the pH at the surface. The breathability of the two applications may be different. Application techniques could have varied from one job to the next. I would have either the original applicator or someone else within that trade come out and assess the situation. I hope this helps. We had our 16 year old driveway resurfaced and stained last January. There is a large area that never dries out and appears to be condensing moisture in the air. The driveway is wet to the point where there is a small puddle in this area. The sealer is bubbling up, flaking and peeling in the wet area. Underneath the flakes of sealer, the concrete looks wet. It appears that the moisture is coming up from underneath the driveway. The driveway has been restained several times, but it doesn’t seem to adhere in the wet area. The remainder of the driveway that isn’t wet has a very nice appearance. Would waiting for the hot summer to dry it out would that permit me to recoat the wet area and have a chance of holding up? Thanks for the question. It may help the sealer better adhere to the top of the concrete, but obviously, it doesn’t sound like it will keep the moisture from coming to the surface. I would find a knowledgeable supplier of sealers and have a discussion with them regarding best material type sealer to use for this situation. This may require a chemical makeup different than the sealer on the rest of the concrete. Thanks for the comments. The surface cracking usually has to do with the early drying of the concrete. i.e. dried too fast, not enough surface moisture kept in, for long enough to help with early curing. As far as the color, the best I can say is the “brown” areas may just be areas with more moisture and, when they dry, the color may lighten. Is there anywayay of staining old house floors that are consistently damp. No barrier was placed under conctete. What I need is a sealer that can breath and release moisture….. Thanks for the comment. Yes, there should be options for you in this situation. My best recommendation is to contact a reputable decorative concrete contractor in your area. Good luck. Thank you for the comment. While I haven’t ever heard of concrete moisture directly causing odor, the discoloration underneath the rugs might be indicative of excessive concrete moisture. You may need to have someone out, possibly an engineer, to evaluate whether there is an intact vapor retarder under the slab and what levels of moisture are in the slab. FYI, in order to verify the presence of a vaper retarder, they will have to do core samples of the slab, but knowing this helps to understand whether moisture vapor is being allowed to enter the slab through the soil. You may be able to also send the core sample out for analysis to see if that can help shed any light. Good luck. I’m in Florida. We have an undercover concrete patio from the 1980s that was covered with outdoor carpet until 3 years ago. Our contractor removed the carpet, ground the surface, laid a textured layer, stained it and then clearcoated it. It looked fantastic but within a year white blush appeared in some areas below the clearcoat. The contractor removed the clearcoat and laid on one that was supposedly a little more porous but the problem came back and is now extensive. It seems to be efflorescence. The only other fix they have tried is to brush xylene on the affected areas. It helps a bit but does not completely remove the white and soon the white returns anyway. They tell me that they are now are out of ideas. Is there some kind of epoxy paint that I can apply that will hold the efflorescence blow the color layer or some other such solution, please? Make sure to read to the end for decorative concrete. Good Luck. I have had a cream polish done on a new slab, it was fully cured and dry, we covered with chipboard after the cream polish to protect during construction period and rain got in, areas have milky white bubbles apeard, and some of them the coating scratches off with fingernail, concrete polisher claims this is my fault because moisture got trapped and charging extra to fix it. Thanks for the question. Depending on the breathability of the chipboard, he may be correct. The moisture can get trapped and cause issues. The only way to really know is if you have an independent inspector or possibly the supplier/manufacturer of the products used in the polishing. Good luck. I have an outdoor fire pit that is supposed to be made of cement. The entire top is bubbled up and cracking really bad. The cracks are slowly creeping down the side. I was wondering if it would be possible to hammer the bubbles out, remove the cement to the metal surface, fill in with an adhesive and tile over the metal? It’s really heavy and only 6 months old. We have no way of removing it but it looks horrible. Our son wants to get married in our back yard and I don’t want the fire pit to take away from the look of the patio area. Thank you so much. Thanks for the comment. Your question is very specific to your situation and not a common one I have received. That being said, I can’t say whether your proposed solution would work. It sounds like it could be viable, but I wouldn’t know for sure. Good luck. You describe a problem above that I am experiencing, my blue stamped concrete has turned mostly brown. This happened after an application of sealant. I had been resealing it every 2 years prior to that with no problems. Is there a fix to this problem or am I stuck with the brown? Thanks for the question. Depending on what exactly has caused the problem, you may be able to have color reapplied topically to restore the previous appearance. I would have a decorative concrete professional come out and take a look. Good luck. I recently had my concrete floors polished, stained and sealed. The problem we are finding is that there are yellow blotches on our gray floor. We had VCT that were removed and the mastic cleaned away. The yellow spotting only occurs in the areas where there were tiles. When we put down the stain the spots are not visible but when we sealed the floor they would show up. Is there anything we can do? Thanks for the question. I would get back together with the contractor and have this discussion to see if they have seen this issue prior. It could be the lack of breathability of the sealer, residue left from adhesive removal, etc. Having this discussion should allow for an appropriate plan to be established. Thanks for the question. It sounds as if salts have migrated through the slab, to the surface. Sometimes when finishes are redone or changed, the breathability of the concrete is altered. With many breathable finishes, the moisture in the slab can travel through and into the air, never leaving behind a noticeable salt residue. If the new finish is applied and it is less breathable than the previous finish, it may leave this type of whitish stain. Obviously, you may also need to look at any potential product issues. Good luck. Jason, I work in a building that was built in the 60’s with no vapor barrier. When the building was upgraded about 10 years ago they used vinyl tiles on the floor. As you can imagine the adhesive didn’t hold and now the tiles are peeling up. We’ve had flooding people come out and they have measured the moisture content in the floor at about 80% (We are in Florida). What is the best solution for flooring in this case? Thanks for the question. In the scheme of things, 80% RH, in most cases, is a great number for installing finishes. Unfortunately, that number for you is really inaccurate because you know there is no vapor retarder under the slab. What that means is that the 80% RH today could easily increase to substantially higher RH% if the moisture vapor in the soil increases because there is no separation between the soil and the bottom of the slab. You could either try for a more moisture resistant and/or breathable floor covering or apply a moisture remediation product, good to 100%RH (make sure the product warrants even if the slab has no vapor retarder) to the surface of the concrete. Most other options would be done knowing continuous repairs were going to be necessary to keep the floor in one piece. Good luck. I agree it does sound like efflorescence. You should have a tradesman look at it to confirm. If it is there isn’t anything you can do at this point except remove the sealer/coating put a vapor barrier on it and reapply coating. You can try to clean the efflorescence off with vinegar (cut 50/50) and a soft bristle broom. Efflorescence is more noticeable in winter than summer. 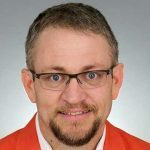 Hi Jason – appreciated this article and think I am dealing with moisture issues. We just had a new concrete floor poured in our home. The contractor applied a sealer over the integral concrete. Dark spots have begun appearing randomly, as well as some long surface cracks, uneven coloring, and noticeable blistering. Our contractor is proposing that they sand down the surface to remove the seal, let the concrete breathe, and then reseal the concrete when it is suffiently dry. Does this seem like a reasonable approach? They are proposing sanding with hand-held units and I am concerned they do it unevenly. Also, will the moisure-based discoloration disappear if the seal is removed? Appreciate your thoughts and I have photos to show it helpful. Thanks for the question. The contractor’s approach seems valid, although the hand-held units seem like it would be fairly labor intensive. As far as the discoloration, in theory, it should dissipate, but that isn’t always the case. My only question about the process would be, once the concrete has been deemed properly dry, what additional concrete preparation steps will be necessary prior to sealing the floor? It would seem to me, if the floor is “opened” up, if foot traffic happens on it for say months, the concrete would need additional prep prior to sealing. Just a question to ask. Thanks for the question. The best I can recommend is that you put some water on the dark area and see if it beads up. This will at least potentially tell you whether it is some type of oil based product. Good Luck. Jason – it appears you have no shortage of problems! I have a newly laid exposed aggregate driveway. I initially applied 2 coats of solvent sealer, the first diluted with solvent as per manufacturer recommendation and the second undiluted. The sealer dried and looked good. A few days after rain, the concrete had a spotted appearance (the area under cover and not rained on was OK). On closer inspection it appeared that the sealer had not penertrated into all the small pores in the aggregate and the water was ‘wetting’ these areas. On advice, I applied another coat (undiluted) – this was after a suitable drying time and the wet spots had disappeared. Alas, after rain the spots are back again as if the sealer had still not penetrated all the pores. Should I try to apply another undiluted coat or a diluted coat (less viscous) to try to fill these pores?? Thanks for the question. It seems, based on your observations, that the sealer isn’t penetrating, or getting into the pores, is certain areas. I would be trying to find the appropriate solution for this symptom. Contacting the sealer manufacturers technical line would be my first phone call. With some discussion and possibly a few photos they should be able to line things out. Good luck. I bought my house brand new two years ago. about 8 months into living in the house. My floors are light color stained concrete with design grout throughout. I live in texas and all houses are lined up. So pretty much was land and now houses all the same lined up from street to street. When it rains a crack in the front entry way gets dark spots, moisture in them and stays like that until it dries up. Since it has been a rainy season we have not caught a break. There are now water stains big water stains, noticeable where the water dark spots are. It happens every time it rains. i got gutters put on the house and also had the roof inspected and the crack outside the door resealed. The crack that the moisture comes up isn’t big to where my inspector of the house finds it alarming. There are natural cracks through out the house. The front entry way is the only area where it is pretty much ruined. Terrible water stains and dark spots until they dry up which some times is weeks if not a month. I do not what or if there is anything I can do. Thanks for the questions. I would first focus on ensuring there is proper drainage away from the house. Having gutters doesn’t always ensure the water being diverted to the downspouts is making its way away from the house. That being ensured, I would question if there is an intact vapor retarder below the slab. To verify that, if this problem is substantial enough to you, you may need to consult with someone to do core samples of the slab. Good luck. Every concrete contractor needs to have this information, so stamped concrete can start getting a better reputation! It’s sad that people have heard so many bad things about stamped concrete, when all that needs to happen is contractors to have better skills and know how to make that stuff last! Thanks for sharing this scientific info! I have a question. My basement flooded and our floors have been stained and beautiful for two years. The water made it bubble and peel up. Do I sand it down, stain again and top coat it again. What grade sandpaper would I use if this is a fix. Thanks for the question. You may have to do all of these steps, but the finish coat may just need to be removed and another finish coat of applied. I would contact a decorative coating supplier in your area for specific recommendations. Good luck. I recently had my concrete sealed for its 3rd time after 10 years, The first time the colour was similar to the coloured concrete, the last 2 times was a change to black. Before having this change we noticed after rain that we would be left with white powder around the the cuts in the concrete where water would seep up and then disappear. After having the new black colour it didnt take long before the black peeled off in patches and to clean the concrete with a hose would remove the paint. I had the tradesman come back to repaint and he said he was unsure if it would happen again…. It did… 1 month later the paint has peeled off again in the same areas. What are we doing wrong and how do we fix it? What a great service you’re providing to people. Thank you! My 85 year old neighbor had a new concrete porch and walk poured in the late fall. (Our management provided it, via outside contractors. They covered all of it with plastic to dry, because a cold snap was approaching. When it dried, it had dark lines/patterns all over it. It looks terrible. The contractor was just here today with chemical treatments that didn’t work. He left to look for other products to try. He doesn’t know if anything will help, but says it should fade with sun and weather “over the years”. What caused this, and is there really no solution except “years”? I’d love to help her with this. She has such a lovely yard and is understandably upset with the way this looks. It’s a large porch and walk, very new and white, and the stain patterns almost black. I’d be glad to work on it with a deck brush if I knew what to use. Again, thank you for your time and expertise. Thanks for the question. These lines could just be areas where the concrete is still wetter than the other areas, its hard to say from your description. If it is really that bad, they may want to look at some topically applied colorant for the concrete to mask the issue. A decorative concrete contractor may be able to help. Good luck.